The higher minimum wage debate is something I have hesitated discussing. The reasons are numerous, but mostly because I think the discussion is missing what I predict will be the worst unintended consequence of the law. A higher minimum wage increases the incentives for skilled labor to compete with and displace unskilled labor. Let me illustrate this with a personal story. When I was in college I had a minimum wage job delivering pizzas. In addition to the basic wage, drivers got a per delivery fee and we got tips. If you got good shifts, you could take multiple pizzas on a run and make a good hourly wage. It has been a long time since I delivered pizzas but I recall making on average $12 an hour. Had I worked the job full time, that works out to $24,000 a year. To keep this example simple, we won’t count fuel and car maintenance costs. 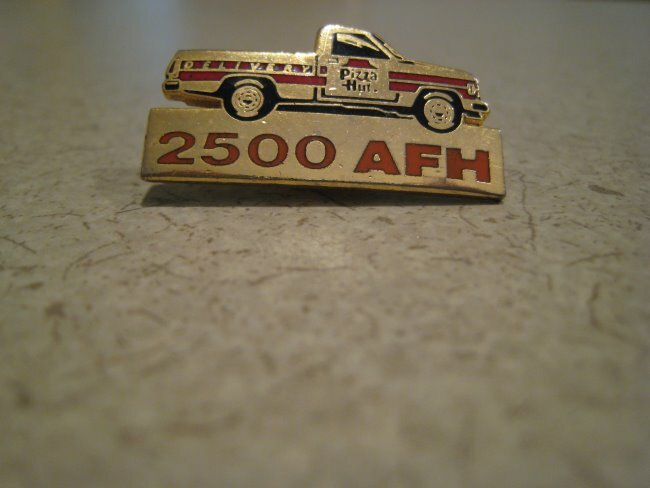 The 2,500 accident free hours pin I earned working for Pizza Hut. As soon as I graduated college, I left Columbus for St. Petersburg, Florida and immediately got a job delivering pizzas. The tips were not as good as when I was Columbus. I estimate that I was averaging $9 an hour. After a few months, I landed an entry level office job making $24,000 (or $12/hr). Not a lot, but it was Florida and it gave me a foot in the door that would lead to better jobs at higher salaries. My plan was to aggressively pay down the debt I racked up in college, so I would work the office job during the day and drive pizzas around in the evening and on weekends. That plan lasted for about two months. I was getting paid more per hour for my skilled labor (office work) than my unskilled labor (pizza delivery). My time was worth more than $9 an hour, so I quit delivering pizzas and instead devoted those hours to improving my coding skills. I had a choice. Many of the drivers didn’t. Both pizza delivery units I worked for had a combination of college students, college graduates looking for better work and unskilled workers that may have a high school degree or equivalent or they were drop outs. For every shift a college graduate worked, that was one less shift the guy without the college degree could work. It sounds harsh, but the managers had only so hours they could schedule. Increasing the minimum wage feels like the right solution to helping unskilled labor, but it has the unintended consequence that more skilled labor will compete for those jobs. A far better solution is to increase the EITC (Earned Income Tax Credit). It is a cost paid for by all of society, not just the entrepreneurs and their customers and it is directed at those that need help the most. Had the minimum wage been increased by $3 while I was working for the Florida pizza delivery place, I would have continued working there on nights and weekends at least until my office salary increased. Every hour I worked would have been one that the high school drop out driver couldn’t work. Now multiple my story a few hundred thousand or a million times and you could see how income inequality could potentially get worse with an increase in the minimum wage. And those stories won’t show up in the unemployment data. I agree with your assertion that a big increase in the minimum wage would likely have unintended side-effects but I am not sure if the one that you mentioned is inevitable. Wouldn’t the salaries for skilled positions go up as competition for the labor increases as skilled workers start taking unskilled jobs? Good point about increasing the EITC as an alternative. Seems much less politically contentious and disruptive than an abrupt minimum wage hike. @Jeff – Another concern of mine which ties into your question is we have a plummeting labor force participation rate. This is more accurate measure of employment than the U-3 number cited by the press. Enter a starting year of 1975 and redraw the graph. It is pretty ugly. If only 63.6% of the potential labor force is working that makes pushing the cost of salary increases difficult. Also when you increase salaries, you increase the incentives for wage arbitrage (moving jobs to a cheaper state or country) or automation. And automation is especially threatening to unskilled labor. 2 great podcasts on the topic. Another comment I want to stress is that minimum wage increases are costs paid by entrepreneurs and absorbed by their customers, which are often low wage workers themselves. EITC is a cost absorbed by ALL tax payers, with higher earners paying predominantly more. “Denmark has no minimum-wage law. But Mr. Elofsson’s $20 an hour is the lowest the fast-food industry can pay under an agreement between Denmark’s 3F union, the nation’s largest, and the Danish employers group Horesta, which includes Burger King, McDonald’s, Starbucks and other restaurant and hotel companies. By contrast, fast-food wages in the United States are so low that half of the nation’s fast-food workers rely on some form of public assistance, a study from the University of California, Berkeley, found. American fast-food workers earn an average of $8.90 an hour. As a shift manager at a Burger King in Tampa, Fla., Anthony Moore earns $9 an hour, typically working 35 hours a week and taking home around $300 weekly. To pay fast food restaurant workers a living wage would entail more than raising prices. We would need a national shift in priorities. “It’s very inadequate,” said Mr. Moore, 26, who supervises 10 workers. His rent is $600 a month, and he often falls behind on his lighting and water bills. A single father, he receives $164 a month in food stamps for his daughters, 5 and 2. Mr. Moore’s daughters receive health care through Medicaid, while he is uninsured because he cannot afford Burger King’s coverage, he said. @Charles – Large fast food companies are increasingly moving towards automation. Although that story may look good on the surface to many, it will just accelerate the demand for robotic replacements. My view is that unskilled human labor needs to remain competitive against automation for as long as possible. During which time they can develop skills that can’t be automated or automated easily. The 26 year old single father with kids 5 and 2 years old should have gone to planned parenthood. I can only guess that his life took a traumatic turn when the mother left the picture. Which is very sad. But… still… both of them should have planned better. Either with a life insurance policy that made sense, or waiting until income was providing a living wage before having children. Thus, the planning part of planned parenthood becomes very important and worth supporting. Very sad situation, any way you slice it. Interesting take on unintended consequences, MAS… have you looked at entry level positions for graduates to see if the difference between that pizza delivery job and entry level “graduate” work has closed or even flip-flopped? 90% of entry level admin assistants make more than $30k ($15/hr), with a median over $37k ($18.50/hr). So, the $15/hr min wage seems pretty equivalent (or still too low) if you take your $12/hr “good” delivery job versus your $12/hr entry level “skilled” office job. The loaded word Entrepreneurs; as if this is a sacred status and that such persons (McDonalds?) shouldn’t shoulder the burden of a living wage for their workers in order that they should, at all costs, succeed. I say, if you don’t have a business plan that can succeed without unfair, underpaid labor, you don’t have a business at all. Too bad. That goes for Joe coffee shop owner and Jeff Bezoz and Micky D’s. The burden to the public may be a higher cost for goods and services, many of which I would argue they don’t need anyway. @Justin – If McDonalds announced tomorrow that they were going to start pay at $20/hr, what do you think would happen next? They would get a surge of applicants. Both skilled and unskilled. Remember only 63.6% of working age Americans are working now. There is A LOT of potential interest in those opening. Who gets the job? The single mom with a GED and no work experience or the recent retiree looking for supplemental income that has 30 years work experience? At a given price you take the more experienced worker. Raising the min wage doesn’t solve inequality. Unskilled labor has a tough enough time trying to gain employment. Providing incentives for skilled labor to compete for those hours does not make their life better. Had Florida raised their min wage $3 back when I was at Pizza Hut, I would have kept working 20 hours a week there. That is 20 hours a week the high school dropout couldn’t have worked. EITC solves that problem. @MAS Not sure what to make of that graph. I don’t think that the decline is due to boomers retiring but if you draw it starting in about 1965 when they started entering the workforce it is somewhat symmetrical. I have read many accounts though of Millennials living in their parents basements and 50-somethings unable to find substantial work since 2008. You are right: automation is eating low-skill jobs (and increasingly, higher-skill work). Not sure what the solution is though. Training, sure, but it is expensive and educational debt is a tough sell to someone up to their ears in consumer debt and working a low-wage job (or jobs). It is a real mess and I don’t see the public sector being agile enough to respond to the accelerating technological advances that are disrupting labor. Then again maybe I am just getting old and crotchety. I’ll have to check out those podcasts. Thanks for the links. @TT – I have an older post with a chart showing how earnings of college graduates started to flatten around 2000. I don’t have recent numbers, but I suspect the job situation is still not ideal for Millennials. As long as the FED suppresses interest rates, Baby Boomers are not going to retire, because fixed income returns are abysmally low. How do you think the availability (or not) of meaningful benefits plays into this? For example, I’ve known a number of freelancing people in the arts and fitness industries who have taken lower paying “day jobs” just to get health insurance. @Mark – Good benefits increases the true rate of compensation, which increases competition from skilled workers. So the sweeter the benefits package for lower wage jobs, the less likely over time those positions will be held by unskilled workers. As for automation, I think that when automated cars hit the roads (some are saying in 5-10 years? ), the low-skilled market will be disrupted at an unprecedented level. Truck , taxi, limo, Fed-Ex and UPS drivers will all see their jobs at risk. @Jim – Thanks. I agree. If your job can be defined by an algorithm it will be replaced. It is just a matter of time. I don’t necessarily see that as a bad thing though, but I’ll save those thoughts for a future post. You make a good point and it is very true. I’m 30 years old and I also work at Pizza hut (inside). Because I am a felon for the rest of my life for something dumb that happened several years ago, and because I do not have college education, obtaining a job that pays a livable wage is very difficult. As much as it bothers me that I work much harder and make much less than millions of Americans I seem to be the only person earning a poverty wage who understands that raising the minimum wage will have more negative impact on us then positive. I know they try to tell us that raising the minimum wage wont cause inflation, but how could in not? If the company I work for is forced to pay its employees much higher wages, where is that money going to come from? We certainly know the owners and CEOs are not going to take pay cuts. We will end up raising our prices, and so will everyone else. after a couple years $15 wont go an further than $7.25 goes today. The other thing is, when the wage goes up, everyone’s wage will go up to exactly $15 and no more. so the 5 years of loyalty and experience that has me earning a couple dollars over the minimum now will mean nothing and I will have to start from the bottom again. Everybody can not be middle class, its just not possible. Workers who are making $15-$20 an hour already are not going to get giant raises when minimum wage goes up, most will keep their same wage. we are not being brought up to their level, they are being brought down to our level. When our middle class citizens are earning just over minimum wage they are no longer middle class. Middle class America will be eliminated. the wealthy will be fine. We know they will see to it that they are taken care of. the percent of low income families in America will skyrocket. The powers that be know what they are doing. They will make it look like they want to help us and that they care about us, but in the long run the wealthy are just going to get wealthier and hey know it. 1. At least 1/2 of a companies profit before payroll must be paid out to employees in the form of wage or salary. this would still allow companies to stockpile money, and would still allow many people to be very wealthy, just not and expense of their laborers and their families. @Working American – I do agree with the first half of your comment. For the company that afford to bear the higher wage costs, those costs will get pusher to the customers. What rarely seems to be discussed is that the customers of businesses that hire low wage employees are often low wage themselves. Rich people don’t shop at Walmart and eat at Taco Bell. I still prefer the EITC as a way to handle inequality. It makes sure the people that most need help get it and the cost is paid by all taxpayers, not just the customers of that business, who are often low wage themselves.